Limited to a fall winter season only, this tea will perfectly accompany your baked goods table. 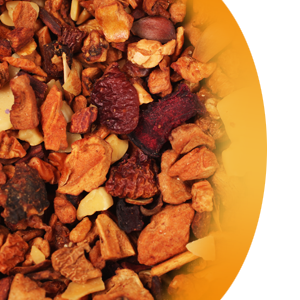 Discover the scents of warm apples and roasted almonds tangled together in this delicious tea blend. Low in acidity, the taste is pleasant and sweet with a highly aromatic cakey flavor of baked apples, roasted mixed nuts and almonds, cinnamon and beetroot pieces. Contains nuts. Caffeine free.